Begin by preparing all of your ingredients. Make the custard and pudding according to box directions. Allow to set and refrigerate until ready to use (this will take at least an hour to set). If using frozen pound cake, allow your pound cake to defrost. Wash your berries and peaches. Defrost your whipped topping. When defrosted, slice the pound cake into small pieces. 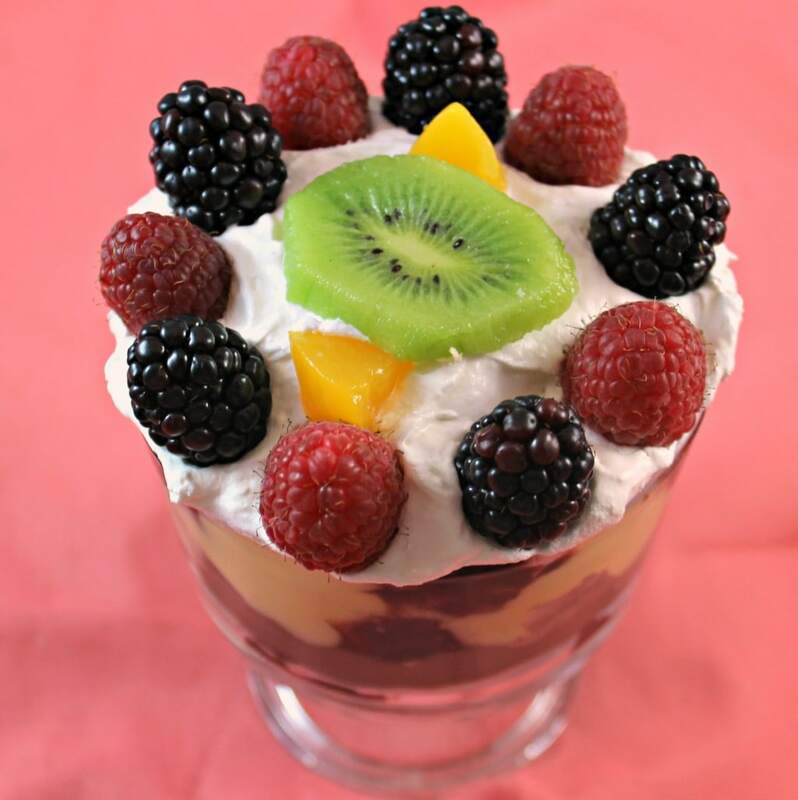 (If making a traditionally sized trifle, slice them into 1/2 to 3/4 inch slices.) Add 1/2 of the sliced pound cake to one plate and the remaining half to another plate. Lightly brush the pound cake on one plate with white rum (you do not want them soaked, just lightly sprinkled). This step is completely optional. Add the jam to one side of the cake slices that were not flavored with liquor. Alternate the jam slices and the liquor slices in the bottom of your bowl. (to get the effect of the layering, use a clear glass bowl). Be sure to really press the cake against the sides of the bowl so that you can see the jelly. Be sure to also add some of the cake to the center of the bowl to create a complete bottom layer. Add a layer of chocolate pudding on top. Follow with another layer of the cake, and top that with custard. Add another layer of cake. Continue this process until the bowl is filled. If you are making the trifle ahead of time, you can cover the trifle at this stage and refrigerate. When ready to serve, top with whipped topping. Add a kiwi slice to the center of the bowl on top of the whipped cream. Add slices of peaches around the kiwi to create a floral pattern. (On my mini trifle, there was not enough room for this, so I added a few cut pieces of the peach around the kiwi). Line the rim of the bowl with the berries, alternating between raspberries and blackberries.